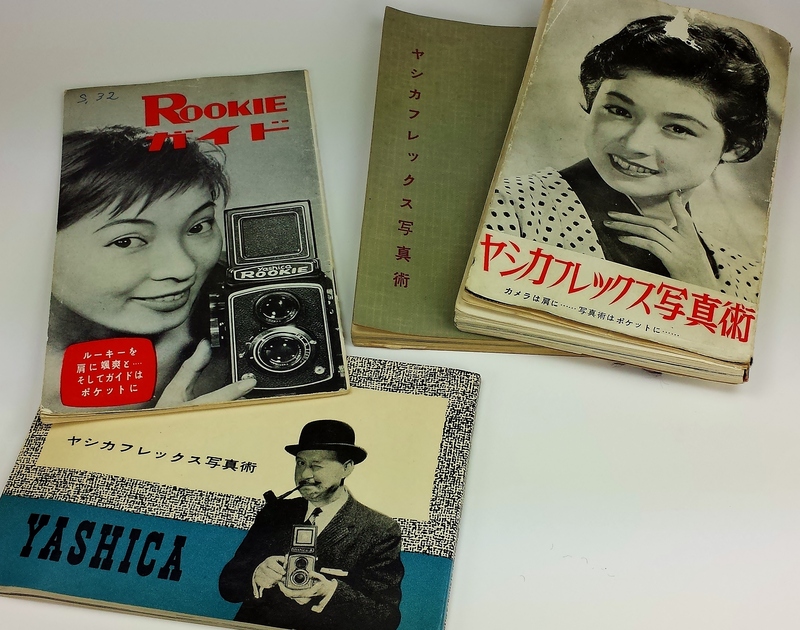 Some classic Yashica (Yashima Optical Co., Ltd.) instruction booklets from the 1950s. Before there could be a Pentamatic, Yashica had to start somewhere and that somewhere was with easy to build twin lens reflex (TLR) cameras. TLRs were also know as medium format cameras that took (6 x 6 cm) or 2 1/4 x 2 1/4 inch sized images on 120 roll film. In the early 1950s the competition between Japanese camera makers was to say kindly, fierce! Out of hundreds of start ups in those early days of the 1950s, only a few manufacturers would emerge by the end of the decade to compete not only in the domestic market, but in the growing global marketplace as well. Going head-to-head with well established camera companies from Germany and in some cases, the United States. From the series of “Yashica flex Photography” books from the 1950s. photography and even how to develop the film and make prints in your own home darkroom. Yashima also included sections on using accessories such as filters, flashes, tripods, cable releases and lens hoods. Not all of the accessories were made by Yashima… often other manufacturers products were included and identified by name. Generally not seen in instruction books of the time (and certainly not today). So bravo to Yashica! These books serve as a great reference to any collector and I’m sure introduced and encouraged many a young photographer of the day to achieve greater confidence in their picture taking abilities. ← Pentamatic… great camera or epic fail?